By maintaining a close-knit group, we give our patients extraordinary one-on-one attention, and superb results. We have two board-certified specialists in orthodontics and one focus, so you can expect us to provide you with the finest and most cutting-edge treatment available. Our digital x-rays provide higher resolution, far less radiation for our patients, and are better for the environment. We offer early morning, evening, and Saturday appointments for your convenience. We offer no down-payment and zero interest payment plans so financing doesn’t get in the way. We are move than willing to work with you to achieve the beautiful, healthy smile you deserve. Both children and adults feel comfortable in our state-of-the-art environment. The first time you visit our office, you will be given a tour of the office, including the sterilization area, the in-house laboratory, and the new patient consultation room. The privacy of this room will facilitate open discussion about all of your treatment goals with Dr. Berkman or Dr. Shapiro. A thorough orthodontic examination will be completed, and a diagnosis will be given. All of your questions will be answered with knowledge and expertise. In many cases, computer simulations of treatment options will be shown and discussed. 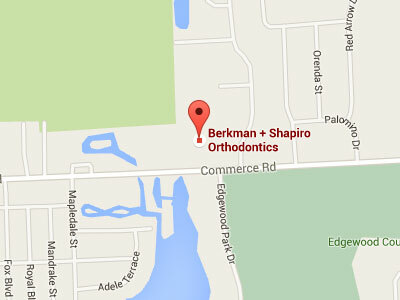 At the conclusion of your examination, Dr. Berkman or Dr. Shapiro will discuss their recommendations, if any, for treatment. Factors such as treatment duration and the best time to start will be reviewed. Our doctors believe in starting treatment only at the “right time,” according to everyone’s individual needs. While some patients are ready for braces right away, others are not, and may be placed on a recall schedule so that they may be monitored until it is exactly the perfect time to start. For those patients who are ready and eager to start treatment right away, we can proceed immediately following the consultation. Note: You’ll need Adobe Acrobat Reader in order to read the items listed above. If you don’t have Acrobat Reader already installed on your computer, you can get it here.